فرودگاه بین‌المللی کینگ شاکا (به انگلیسی: King Shaka International Airport) یک فرودگاه همگانی مسافربری با کد یاتا DUR است که یک باند فرود آسفالت دارد و طول باند آن ۳۷۰۰ متر است. این فرودگاه در شهر دوربان کشور آفریقای جنوبی قرار دارد و در ارتفاع ۹۰ متری از سطح دریا واقع شده‌است. ^ This flight operates between Doha and Durban via Johannesburg. However, هواپیمایی قطر does not have rights to transport passengers solely between Durban and Johannesburg. 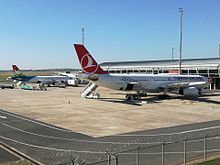 ^ This flight operates between Istanbul and Durban via Johannesburg. However, ترکیش ایرلاینز does not have rights to transport passengers solely between Durban and Johannesburg. ^ ایر نامیبیا have been granted 5th freedom rights and will service traffic between Gaborone and Durban.